When you think of the personality traits of a successful business owner, what do you picture? Sure! A little tenacity never hurt anyone. But what if I told you the most important quality a business owner can have is … empathy? Let’s say you can’t throw anything out and you’re suffocated by your clutter. You decided it’s finally time to hire a professional organizer. * the person who tells you that five years ago they too had drawers overflowing with old t-shirts? * the person who’s somehow “naturally organized”? * The person who doesn’t tell you anything about themselves or their background? I bet you connected with the person who knows your struggle, didn’t you? It’s human nature! We’re more likely to know, like, and trust people who are similar to us. And – as I’m sure you know – we’re more likely to buy from people we know, like, and trust. Here’s a great example of a blogger showing us how to break bad habits by sharing the bad habits she struggled with! If you can show your clients that you’ve been where they are, found a solution, and emerged triumphantly, you’re modeling success. You’re demonstrating that you’re empathetic to their struggles and you’ve made specific changes to overcome those struggles. You’re living proof that they don’t have to stay stuck! Living proof makes for pretty convincing marketing. When you show your clients you understand them, you’re helping them feel safe. You’re showing them that they can be honest and vulnerable with you. When you say “I get it. I used to be overwhelmed by social media too,” you’re making it easier for your clients to open up to you. And the more they open up to you, the more you can help them, and the better their results will be. These days it’s pretty easy to look at your analytics and see which blog posts your clients read, which tweets they liked, and how many people watched your video. But if you don’t understand why they read that blog post or what problem you helped them solve, that data is useless. What have you struggled with? What hurdles have you overcome in your business? And how does this make you uniquely well-qualified to help us overcome something similar? Maybe you overcame stagefright; maybe you undercharged for years. Perhaps you mismanaged your team and lost a big account or had self-limiting beliefs that held you back for years. Whatever your backstory is: share it. Help us know, like, and trust you. Show us how you can help us overcome what we’re struggling with. You can also look to current events or public figures who are experiencing something with which you empathize. For example, if you’re a financial advisor you could say, “When I heard about Johnny Depp declaring bankruptcy I thought, ‘Ugh. I know how that feels.’” Then you share the story of how you struggled with credit card debt in your early twenties and how you righted that ship to make healthy money management your life’s calling. If you’re a life coach you could say “When Emma Stone talked about navigating her career while managing an anxiety disorder, I wanted to raise my hand and shout “Me, too!” And then you can share how you changed your workday, workload, or daily habits to get past this hurdle. If you’ve been in business for a while, you probably already know where your clients freeze up or give up. You know they’re nervous about being on camera or intimidated by downloading new software. You know which excuses they’ll pull out. Show them you understand them and you’ve got their back! This can be as easy as using phrases like “You might be thinking ___________” or “I know you’re probably worried that ____________”. Then explain why that reasoning or excuse doesn’t apply here. Or just assure them that they’ve got this and it’s not as hard as it seems! My friend Sarah spent years working as a teacher and now creates and sells online courses. Every module of every course includes a ‘Where you might get stuck’ section where she addresses common hurdles! None of these methods will help you if you don’t understand your people. If you don’t know what they’re struggling with, it’s hard to empathize, right? Luckily, there are tons of ways to figure this out. Create a survey and ask your blog readers and newsletter subscribers to fill it out. Make sure to clarify that their answers will help you create things that are more helpful and useful! I want to hear from you! 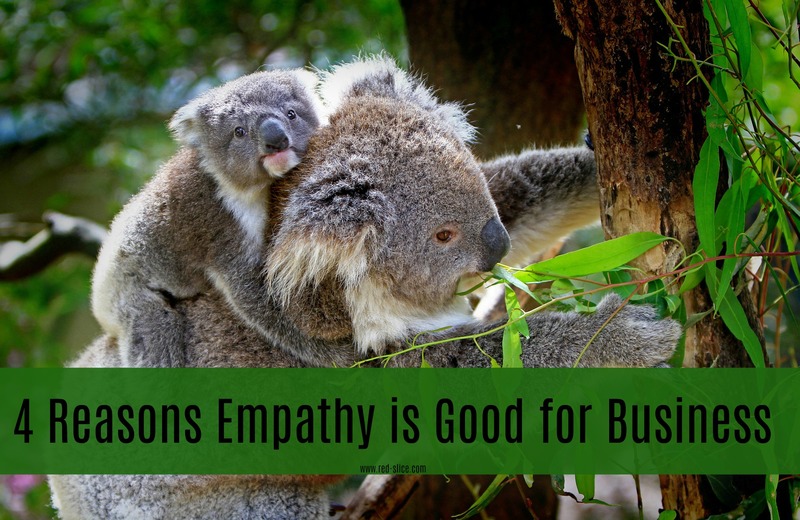 Do you incorporate empathy into your business or writing? Please share on the Facebook page or Tweet me!